I’m a Certified Angel Card Reader, CACR™, trained by Doreen Virtue and Radleigh Valentine, Certified Angel Tarot Reader™ trained by Radleigh Valentine, Certified Level 1 and Level 2 Spirit Junkie Masterclass graduate, trained by Gabby Bernstein, and a super soulful Pisces. Through my readings, I offer divine messages filled with compassion, creativity, light, love, and kindness. As a reader who specifically works with Archangel Chamuel, Archangel Gabriel, Archangel Michael, and Archangel Raphael, I am also able to bring you towards your next move, your next level and you’ll even be able to see a piece of your path. The moment we sit down together we will lock eyes. The reading will be intense but it will bring immense clarity. Your reading will be special. 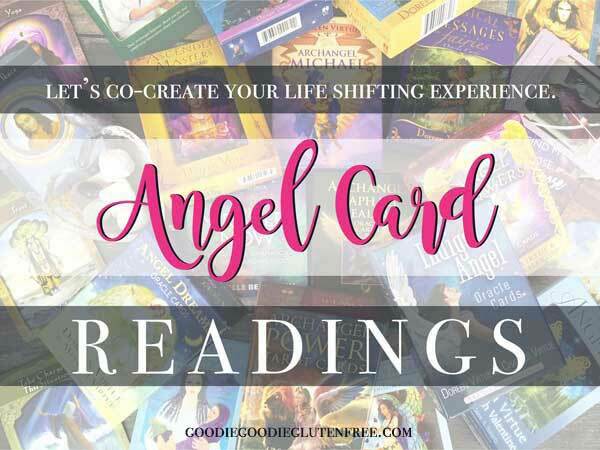 I’m here to help you understand what your readings are about, what they mean, why the angels have brought forth this information and how you can use this healing tool to empower yourself and move forward. Let’s unlock the magic together. I’ve used this healing method personally as a tool to discover my connection with the Angels on my own spiritual path and holistic journey, especially with my health. These readings bring me so much clarity and so much guidance and sometimes it’s like the Angels literally just read my mind. I take these readings seriously. Through this method, I have been able to uncover blocks, pursue despite fear, move forward without sabotage, help myself heal and add more positivity, support, and light to my life. Above all, I am reminded that I am supported and guided. Reading Angel Cards for myself and others is one of my greatest joys! Think of our session together like one amazing and inspiring coaching session that brings enlightened clarity to the table. The cards represent your energies the moment we sit down together. You may even say it’s as if I have read your mind, but I do not have that kind of power. I am merely a messenger for the Angels to speak through, bringing forth the information you already know that is buried or blocked within. Whether you tell me your question out loud, or your thinking the question in your mind, the Archangels will pull your energies and THAT is what will come up in your card reading. My goal is to guide you to feel empowered and clear. I want you to realize that there is so much out there for you to seize. I want you to feel safe, loved, supported, guided, loved, confident and reassured. I want to help guide you reconnect with your mind/body and soul so that you can move forward without fear and worry and feel safe doing so. Practical self-care tools, coaching, and inspiration are always included in my readings. This reading is done via phone, Skype, email or in person locally. Please specify your preference upon the purchase of your reading. We will sit together near or far in like-minded energy bringing in the Angels. You will receive your messages through me. We will sit together for a 3-card spread. You will tell me your question. One question per reading. We will take a look at the messages your angels are sending you, and what symbolism is right under your nose and how to decode it. You will leave your reading feeling a sense of renewal and hope. The Archangels always know that no matter what you ask for, if there is something else pressing in your mind, the Angels will connect with that energy and bring the truth to the surface. 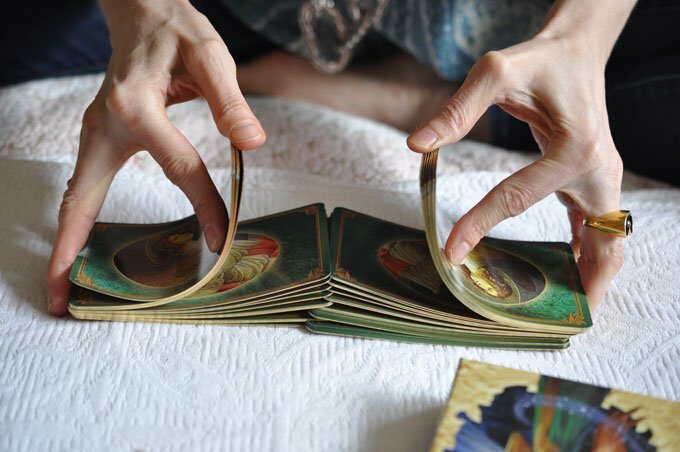 It’s an enlightening experience seeing how Angel Cards have a way of providing so much clarity around multiple situations that it creates an AH-HA experience that is lasting. Angels help us move forward, even in doubt. We will uncover blocks that can help you move forward with your journey and feel more empowered. You will leave the reading feeling guided, inspired, confidence, and at peace with your next move. For email readings only: I channel your energy through a photo that you send me or one I pull off social media. I use music, crystals, and meditation. At the end of the reading, I will send you a few photos of your cards, the card messages, the crystals used, and music played. In this enlightening coaching session, we will take a peek at your behind the scenes through the work of angel cards and positive affirmation cards. Whether it’s your sense of worthiness or lack thereof, your career or your health, we have an opportunity with the angel cards to reach into your blocks and release them. The cards represent what issues are most important for you to resolve within yourself. Because that is such a hard thing to do, Angel Cards are a fantastic guidance tool to help you navigate your own underworld. With the help of the Archangels, we will together discover what the cards mean for you and explore the consistent messages and symbolism, and how they play a role in your life and why certain messages are coming up for you now and, finally what it is that we need to heal and work on. This tool is for your benefit. Angels help us move forward, even in doubt. We will uncover blocks that can help you move forward with your journey and feel more empowered. You will leave the reading feeling guided, inspired, confidence, and at peace with your next move. 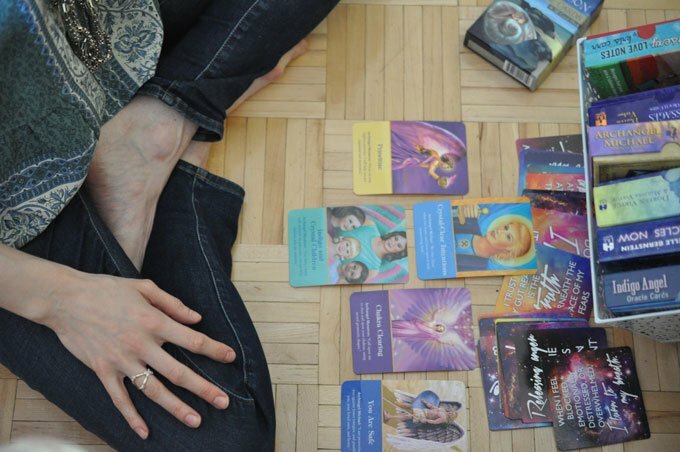 This is an angel card reading with coaching. Come to this session with a notebook. The services I offer are not fortune-telling; instead, they help clients move forward in a positive and enlightening way. I cannot read your future or foretell events happening in your life. The goal is to encourage clients to uncover blocks, break patterns and expand so that they can regain their personal power and move forward in their lives. Need more of a detailed Disclaimer? I know the Universe brought you to me for a reason. I cannot thank you enough for all you have done so far. Your summary of my reading is ridiculous and gives me so much hope and inspiration. I have recently been going through ups and downs in my life and I really needed clarity on what the Universe’s plan was for me. Also, I have recently started studying more about energy and spirituality so it was perfect timing for Julie to perform my reading. 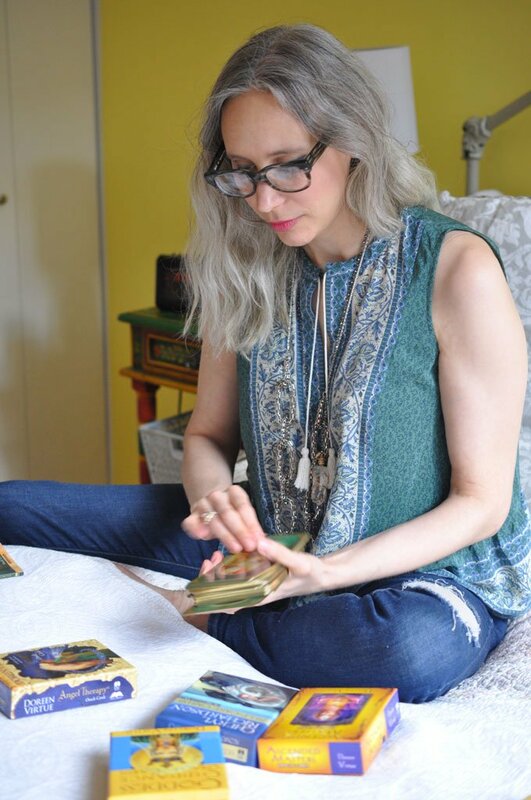 She is so professional, educated in spirituality and Angel Card Readings and extremely knowledgeable about the signs from the Angels and how to apply them to the questions in your life. The cards she pulled were 100% spot on with the questions I have in my life. I still can’t believe how accurate the cards were. After the reading, she provided a very thorough analysis of the cards and how I should apply them to my personal situations. Her kind words and insight have inspired me to keep going: to follow the advice presented to me by the Angels to keep learning about the infinite possibilities that Source provides and most importantly, trust in the power of intention and the plan the Universe has for me. Julie is a multi-talented Angel to me and I highly recommend her to anyone. Julie is a modern-day Doreen Virtue. Hands down the best reading I’ve ever had! The detail Julie puts into her readings is amazing! I did my reading through email, but it felt like I was there with her for it because of the thoughtfulness and detail that went into it. I gained insight and clarity into the situation that I asked about. It resonated with me so much that I choked up a bit reading it. I can’t wait for my next reading! That was so incredible! First of all, I cannot believe that Jesus appeared in my reading! That’s amazing and I am really touched. Everything you said really hit so close to home and really touched me. I was getting chills while reading my Angel Card summary because it just touched me so much. What you said about the feather being a sign was incredible because just this morning my son and I were watching out the window when he pointed out to me a feather falling from the sky so we were watching it together. So neat! I need to read my summary several more times to take it all in. The reading was so in depth! I didn’t know exactly what to expect, yet you really blew me away. Thank you so much, Julie! You are definitely putting my heart at ease. I cannot wait to read my Angel Card summary again and again! I keep looking at the cards and actually when my daughter was in the hospital I kept looking at the child card that you pulled and it made me feel so comforted! Again, I so appreciate this reading, It immensely helped me and the timing was so perfect! The Angel Card Reading Julie did for me was the most extensive and in-depth card reading I have ever received. 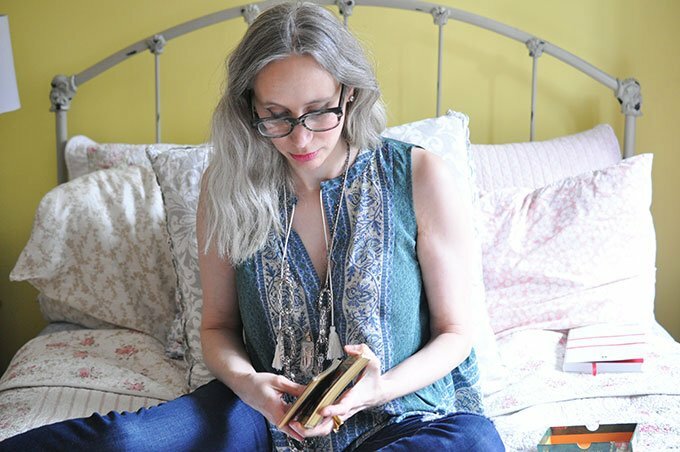 Her connection with the Angels, her psychic gift and her ability to put together a thorough, comprehensive reading is just amazing. She isn’t afraid to be practical, honest and offer supportive advice to break-through spiritual blocks. I received a much-needed confirmation from her reading to help me work on the areas I knew deep down had to be addressed. Julie cares about her clients and puts 100% of herself into preparing and working on her readings. It is very clear that she is passionate about helping people, takes her work very seriously and doesn’t leave one spiritual stone unturned. I look forward to periodic readings and working with Julie as it has helped me in all areas of my life.